Hills get us every time. We know what is coming. We know it won’t be more than a few seconds before we feel that familiar burn in our legs, we find it harder and harder to breathe, and once we reach the top, it feels like forever before our legs feel normal again. But, by using the correct running form for running up and down hills, you can spare your body some of the pain, and feel confident that not only are you going to make it up the hill, but you are going to make it down the other side in the best way possible. 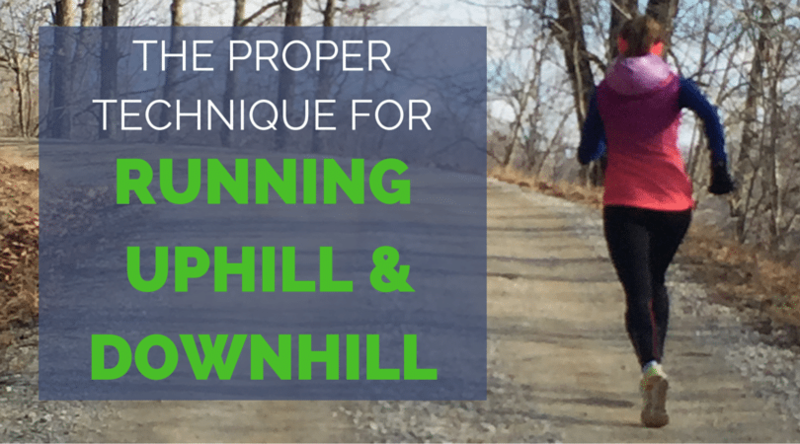 Before, we talked about when and why you should train on uphills and downhills, and today we would like to show you exactly how to run hills. A lot of runners just don’t run with proper form when they go uphill or downhill. What constitutes “good” hill running form is fairly easily to understand once we review a few very basic truths about running uphill and downhill. Ready to make hills slightly easier? When running up a hill, you’ve got to do extra work to overcome gravity. This requires your body to recruit more muscles in your legs to overcome the force of gravity and carry you up the slope. The fact that the ground is slanted also alters your footstrike, forcing you to transition to more of a mid/forefoot-striking style and increasing the forces going through your calves and ankles. No wonder our calves are often sore the day after hills! This is ultimately a good thing when it comes to performance, as it allows you to get more “rebound” from the ground. Some energy from the impact is stored in your calf muscles and is then released again when you straighten your leg and drive off the ground. Most runners’ natural reaction when they start running up a hill is to lean into it, usually by bending forward at the waist. While it is true that some degree of forward lean is necessary when running up a hill, a lot of people lean much too far forward. Leaning forward inhibits your ability to flex your hips and drive your knee drive up your knee during the “swing” phase of your gait. You can prove this to yourself right now by standing up straight and lifting your knee towards your chest using your hip flexors, then attempting to do the same thing if you bend forward at the waist. Did you notice the increase in difficulty? An excessive forward lean shortens your hip flexor’s range of motion, hurting your efficiency. Leaning forward inhibits your ability to produce a powerful “toe-off” during the “drive” phase of your gait. To push off the ground and take advantage of the additional energy stored in your calf muscles, you need to fully extend your leg straight behind you, which is achieved most effectively when your upper body is not slanted forward. When you “stand tall” when running up a hill, it makes it easier for your glutes to extend your leg behind you. Finally, a forward lean also throws your body off-balance by moving your center of gravity too far forward. Without getting too into the nitty-gritty, this also makes it harder for your glutes to drive your leg backwards by increasing the leverage they have to overcome. The positioning of your center of gravity will also come into play when it comes to running downhill, so don’t forget about it. How do I keep good form running uphill? Although you will have a noticeable forward lean when running uphill, it’s helpful to think about “standing tall” when you run up a hill, since you’re unlikely to be leaning too far back. This is one of those mental cues that, while technically inaccurate, is still very helpful. Other helpful cues include “drive your hips” which reminds you to focus on using your hip muscles to power your way up the hill and extend your leg fully behind you. Once you’ve crested a hill, take care not to slouch over, since that will wreak havoc on your efficiency on the flats, too. When it comes to running downhill, the problem is usually the opposite of running uphill: too much backward lean. Shifting your weight backwards when running downhill is a normal reaction, since it slows you down. Much like the incline of an uphill shifts your footstrike forward, a downhill forces your foot to strike the ground more towards your heel. This by itself increases braking forces, and a backwards lean magnifies this effect. If you have been struggling with overstriding while running, and have shin splints as a result, this is the worst thing for your body! If you want to slow down, leaning backwards is the right choice. But since a downhill allows you a “free” increase in running speed (since gravity is giving back all the energy you spent going up the hill), you generally want to take advantage of this, especially if you are racing on a hilly course. When you lean back, you throw your center of gravity behind your body, requiring you to wait until your feet have passed it to start generating force again. You also have to weigh the cost of the increased braking forces from leaning back against the increased impact forces of running faster down the hill by leaning “into” the downhill. While there haven’t been any scientific studies on this, I suspect that it’s better to lean into a hill, since at least in that case your running mechanics are not as different. It’s also important not to lean too far forward on downhills, lest you find yourself careening out of control. As your speed increases, you’ll need to quicken your cadence to keep your feet underneath you. You’ll need to strike a balance between efficiently using the speed from the downhill and running so fast that it upsets your pacing. Short downhills aren’t usually a problem in this regard, but long, gradual downhills can lull a runner into a pace that’s too aggressive, especially early on in a race. If you are racing Boston marathon, we have a whole article dedicated to preparing for those hills on the Boston Marathon course. Remember, you can always lean back if you are running down a particularly steep downhill and need to back off. Once you’ve reached the end of the downhill, you can still “coast” for a bit on the speed boost you’ve gained, but do take care to slow to your normal effort eventually. Efficiently running hills boils down to understanding what you’re up against. On the way up a hill, you are battling against gravity, so you should “stand tall” with a slight forward lean, drive your legs back and lift your knees up to take advantage of the additional power generated at your ankle, and keep your torso centered over your pelvis. On the way down a hill, gravity is helping you along, so don’t be afraid to “lean and go” down a hill, again keeping your torso centered over your pelvis (relative to the slope of the hill). Quicken up your stride to stay balanced, and maintain an even effort, despite the fact that your pace is increasing going down a hill. 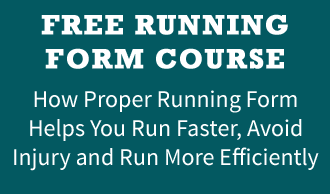 Mental cues like “stand tall,” “drive your hips,” and “lean and go” are great for hill running, since they serve as quick reminders to fix up your running form, especially when you are tired. If you’re having trouble visualizing these concepts, read our previous post on how to run hills, which has some good illustrations. Keeping these in mind will be a big help when you run your next hilly workout or race, and if you are wondering how much hills affect your performance on race day, we have something just for that too! i allways bent my knees, push hip little back, and lean forward when downhill running, and it works well with my minimalist shoes. Yesterday i tried to lean back, but today morning it developed a massive patellar pain in my right knee. Be carefull with leanin when running downhill! Thanks for sharing Laszio. That is exactly what we try to remind runners. Your pain may not be a direct result of leaning backwards, but it is important to lean forward at the ankles when running downhill. Hope you feel better! – When running up a hill, should your breathing be fast and rapid (1-2-1-2-1-2-1-2…) or steady and long (ooonee-tttwwwooo)? 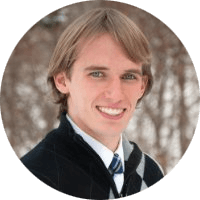 – When running down a hill using the above method you mentioned utilizing gravity to your advantage, does it negatively affect your knees by putting more stress on them than usual? I usually always lean a tad back when running down a hill (depending on the steepness) and slow my speed down in fear of causing damage to my knees. – Does sprinting up a hill have any benefits? I tire myself so quickly if I do that and I feel like it doesn’t help. That leads into another question I have about sprints; is it good to incorporate one full on sprint in a run? There are a few segments of road I encounter that are just flat for some hundred meters and I wonder if a sprint would help me in some way? I live Pittsburgh which is very, very, very hilly and that I want to conquer these hills in a way so I don’t tire as much as I do now and I run up them faster than usual. Thank you soooo much for this article; helped me clear a few misconceptions I had with my mindset of running. Sorry, just realized I was on some other article, here is the title to it (its on this website). Pingback: Level 1: Week 11 – 12WEEK2FIT More than a fitness plan. How do i stop using only my toes and fore foot when running up hill? It is playing havoc with my claves and hamstrings when i am out on ultras.